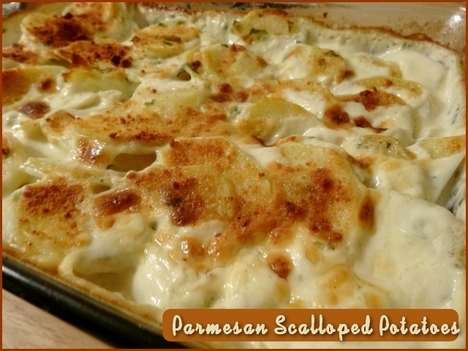 These creamy scalloped potatoes are elevated in flavor by the addition of Parmesan cheese. A great change-up from regular mashed potatoes. Layer the onions and potatoes in a prepared 9x13 baking dish. In a bowl, combine the cream, parsley, garlic, and seasoning together. Pour over the potatoes. Bake at 400F for 30 minutes, stirring occasionally. After the 30 minutes are up, sprinkle the Parmesan cheese over top of the potatoes, and bake for an additional 15-20 minutes until the top has browned lightly. Allow the potatoes to sit for a few minutes before serving. Store leftovers in the fridge.